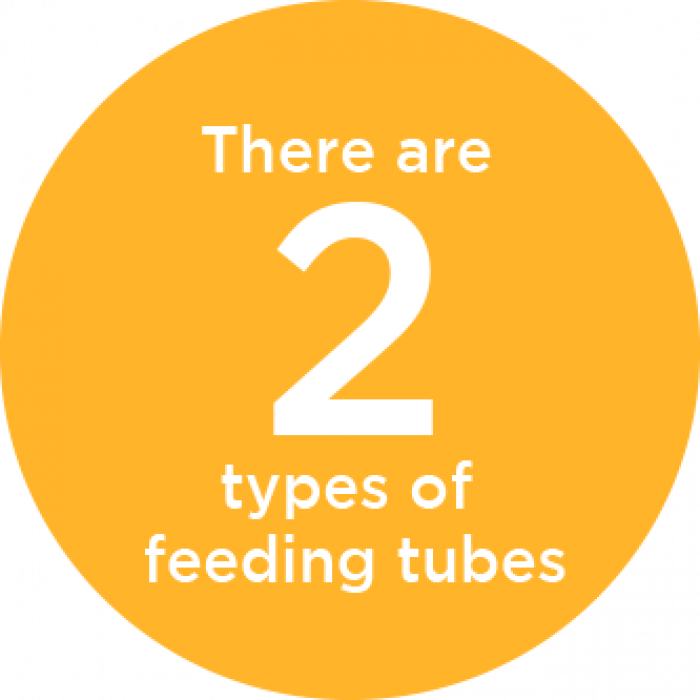 A feeding tube is a soft, flexible tube used to give fluids, formulas and medicine to children who have trouble eating or drinking typically. A surgeon places the tube either through the stomach wall and into the stomach, or through part of the small intestine (called the jejunum) and into the small intestine. Because feeding tubes send nutrients directly into the stomach or small intestine, they can help protect your child’s airway and decrease the effort of eating. There are two feeding tube types: gastronomy tube (G-tube) and jejunostomy tube (J-tube). The main differences between these types are where they get placed and how they deliver food. A G-tube gets placed in the stomach, bypassing the mouth for feedings. 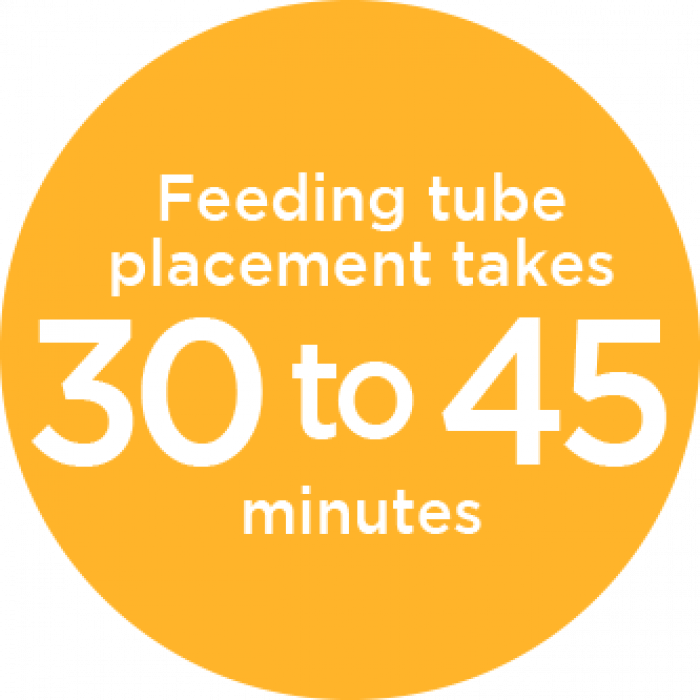 G-tubes might be used full-time (to replace oral feedings), or part-time (for certain types of nutrition or during illness). They also might be used temporarily until a child can eat normally. To place the gastronomy feeding tube, a surgeon makes a small hole (called a “stoma” or “gastronomy”) in the abdomen and inserts the tube. The tube usually remains in the gastronomy. If the tube is removed, the gastronomy might get smaller and close. J-tubes get placed in the jejunum (part of the small intestine), where they deliver continuous drip feedings with prepared commercial formula and a feeding pump. J-tubes are thinner than G-tubes. They’re often recommended for children who experience frequent vomiting, because they bypass both the mouth and stomach. There are two main types of J-tubes. The longer tube extends several inches beyond the skin. The other is device (often called a “button”) that lies flat against the skin of the abdomen. Kids usually start out by using the longer device, since it’s easier to work with on a short-term basis. Later, they might switch to the button. In some cases, a surgeon threads a J-tube into the small intestine through a gastrostomy from the stomach. The surgeon then uses an X-ray to help guide the tube into place. This type of transgastric placement is referred to as a GJ-tube. Who Benefits from Feeding Tubes? Abnormalities of the mouth, esophagus, stomach or intestines. Sucking and swallowing disorders often related to certain neuromuscular conditions, such as severe cerebral palsy; brain injury, being born prematurely or developmental delays. Poor growth or failure to thrive even after dietary supplements. Extreme difficulty taking medicines by mouth. Significant time and effort involved with feedings. Aspiration (when contents from the mouth or stomach go into the breathing tube or lungs during or following normal feedings). Every child’s needs are different. To best work with your child’s unique situation, the providers at Gillette Children’s Specialty Healthcare teach your family how to use tubes for feedings and medicine. After a surgeon places a feeding tube and the stoma has healed, caring for the tube is fairly simple. Several weeks before surgery, we schedule preoperative and other appointments, which usually take place the day before surgery. Our goal is to help your family feel as prepared and supported as possible. We also encourage you to talk about your experiences with other families whose children use feeding tubes. We can help you make these connections. Give you detailed instructions for before and after surgery, including how to take care of the incision and how to detect problems. Make a record of your child’s medical history. Perform any necessary laboratory work, such as blood and urine tests. The anesthesiologist appointment happens on the same day as the preoperative appointment. Because your child must have an empty stomach before going to surgery, we will give you specific instructions about when to stop giving food and beverages. The surgery to place a G-tube is a common, simple procedure that takes 30 to 45 minutes. J-tubes and GJ-tubes can be placed using radiology and imaging in about the same amount of time. Percutaneous endoscopic gastrostomy (PEG) procedure. The most common technique, this procedure goes through the skin. A surgeon “pokes” through the skin using a tool like a giant needle to place the G-tube. The surgeon also inserts a thin, flexible tube with a tiny camera and lighted tip called an endoscope through the mouth and into the stomach to guide the positioning of the PEG feeding tube. Laparoscopic technique. This technique requires several small incisions in the abdomen. A surgeon inserts a tiny telescope to help see the stomach and surrounding organs. The laparoscopic technique can be used with the PEG procedure or with another abdominal operation performed at the same time. If a PEG isn’t safe for your child’s situation. For example, severe scoliosis might make percutaneous placement unsafe because of a risk of injuring surrounding organs. If your child has scar tissue from a previous surgery, procedure or illness. If your child needs another surgical procedure at the same time. Care for the surgery site. Give your child feedings through the tube. Work with a nutrition plan and schedule created by our nutritionists. Stabilize a J-tube or GJ-tube if it suddenly needs replacing, until you can get your child to the doctor. Never attempt to replace a J-tube or GJ-tube yourself. Some children who have a G-tube or J-tube can also eat certain foods by mouth (orally). If one of our providers decides your child can eat certain things by mouth, we’ll help teach your child how to eat independently. We’ll also show you how to handle potential problems, such as how to replace a G-tube if it accidentally falls out at home so the hole doesn’t begin to close. Important: If a J-tube clogs or falls out, you must return to Gillette for a replacement. Never try to replace a J-tube yourself. Feeding tubes can last for more than a year before needing replacement. However, each type of tube requires a different approach. G-tubes: You can easily replace a G-tube yourself, without an additional procedure. J-tubes or GJ-tubes: Because placement of a jujunal feeding tube is difficult, you shouldn’t try to replace it at home if it falls out. Your child will need to see a doctor as soon as possible for replacement. If your child has a gastrostomy, you may give feedings temporarily through the gastrostomy to keep your child hydrated. Keeping the tube well stabilized will help to prevent dislodgment or accidental removal. After a few months of healing, your doctor might recommend replacing the longer G-tube with a button device. This change often takes place in their office, without surgery. The button doesn’t have any dangling parts, and it includes an anti-reflux valve. You or your child can open the button for feedings and medicines, and close it when it’s not in use. For many families, a button makes tube feedings easier and more convenient. For J-tubes, we often use low profile, transgastric GJ-tubes. An interventional radiologist places the tube, which is threaded through the gastric stoma into the jejunum (part of the small intestine). There is a gastric port for decompression and a jejunal port for continuous feedings. Placing a GJ-tube is an outpatient procedure. Children who don’t aspirate can often continue eating by mouth after we place a G-tube. One of our providers will let you know if your child can still eat by mouth and what formula to use with the tube. Some children who have feeding tubes might eventually be able to eat normally by mouth. In these cases, we might remove the G-tube or button. Removal (generally in an office by a doctor or nurse) takes only minutes. The gastronomy usually heals, leaving a small scar. Other kids use GJ-tubes temporarily after surgery or an injury, and then later go back to a G-tube. Children who need long-term jejunal feedings probably won’t be able to discontinue tube feeding altogether. Whether your child starts using a feeding tube as a baby, during childhood or as an adult, we will help them get the proper nutrition they need to lead a healthy, happy life. Our surgical, pediatric and gastroenterology teams support kids who have conditions such as cerebral palsy, brain injury, certain neuromuscular conditions, premature birth or developmental delay. Ear, nose and throat (ENT or otolaryngology). Learn more about hospital services and facilities at Gillette.